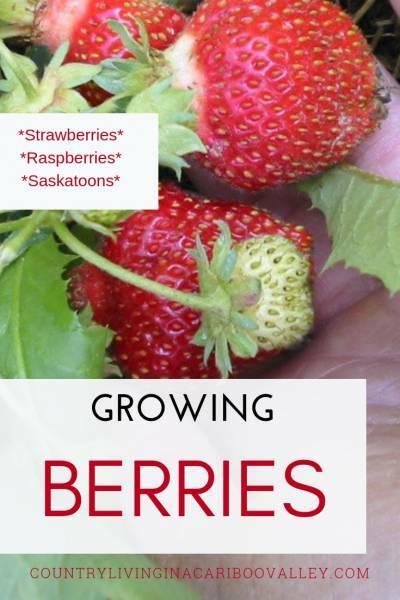 We can grow great berries in the Cariboo. They just love our climate and if we have a lot of rain in the Spring, our berry crop is fantastic. Usually, berries can take the cooler weather at night time. One of the gardening obstacles we have here is the fluctuating temperatures. It’s common here for daytime summer temperatures to be 30C and then go down to 4 or 5C at night time. That’s pretty extreme, but here it’s very common. It can make vegetable gardening more of a challenge. Berries are usually fine with this, unless temperatures start going down to 0C. Here’s some information about the different kinds of berries we grow. One is wild, the others are not. Every year, we have Raspberries and also Strawberries. 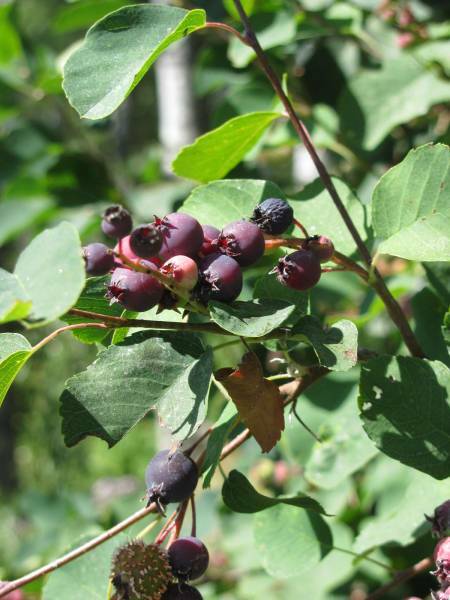 Saskatoon berries are native to our area and their bushes are found all around the Cariboo. We have a lot of native Saskatoon berry bushes on our property. Growing wild, they are really easy to pick and taste fantastic in pies! Saskatoon jelly is also a big favourite. These are Saskatoon berries in the photo. The only thing about picking wild Saskatoons here is that the bears love them just as much as we do. I make sure to sing when I am out picking, just to let the bears know I am there. And frankly, if I am singing, whoever hears me will go the “other” way! We have a large Raspberry bed and it produces huge amounts of berries every year. At harvest time, I am usually really busy with all the other things going on, so I make it as easy on myself as possible for harvesting and preserving raspberries. I bring Ziplock bags with me out to the patch and pick and drop them right in the bag. I try and pick as clean as possible, because it is just not worth it to wash raspberries. Too much berry is lost – they just turn to mush! I put 1 pound of Raspberries into each small Ziplock bag. This way, it is easy to use them for a pie (usually mixed with Saskatoon berries or Rhubarb). One I have about 10 of these small bags, I then start using large Ziplock bags. These will be filled with berries and then weighed and marked. They go straight into the freezer; then in the late Fall or Winter, we start using them to make homemade wine! Each Spring, suckers grow out of the ground from the raspberry canes already there. I pull the ones I don’t want, keep the ones I do want and try to maintain some kind of order in this bed. By mid-September, the raspberries are coming to an end. By then, we’ve got lots of raspberries in the freezer – enough to start several batches of Raspberry Saskatoon berry wine. It is the best homemade wine we have made, hands down. 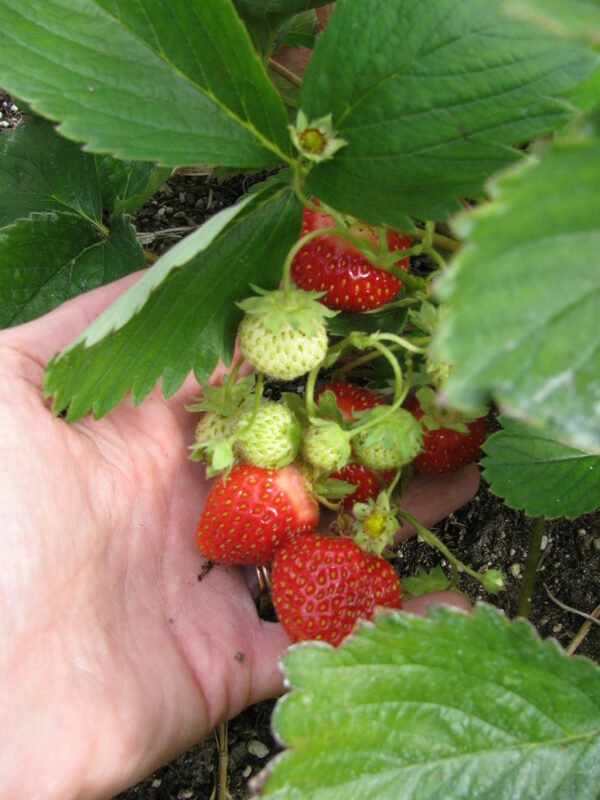 Strawberries can do great here – IF we keep up with the maintenance we can get fantastic harvests of Strawberries. But it is the same everywhere when it comes to Strawberries. 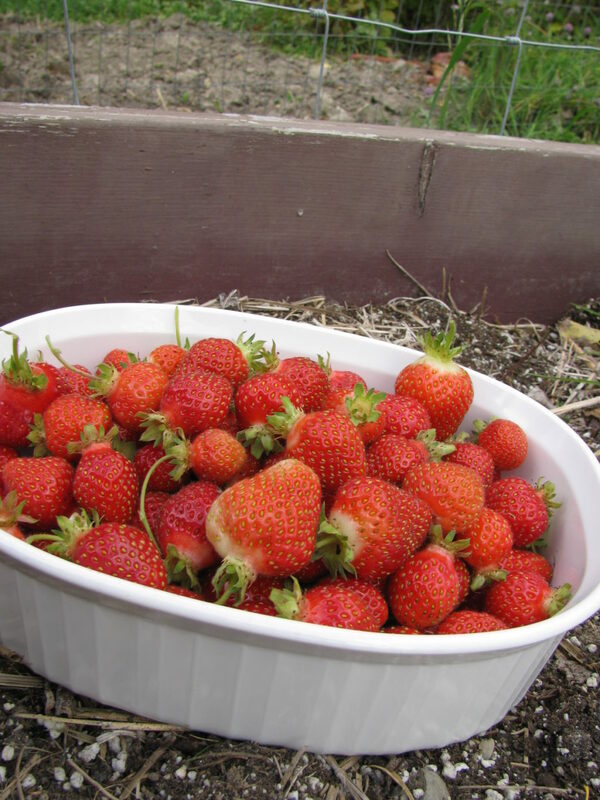 Strawberries are quite easy to grow, although to keep your bed going year after year, some maintenance needs to be done. 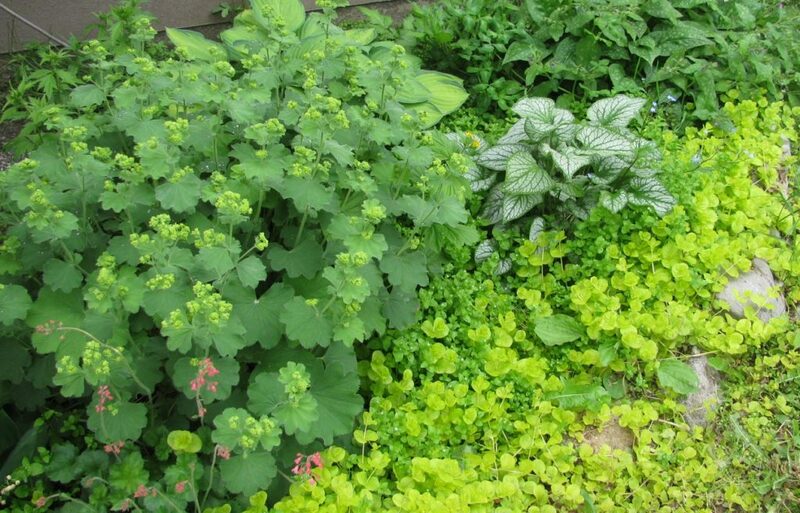 It’s easier to keep track of if you have several separate beds of plants. 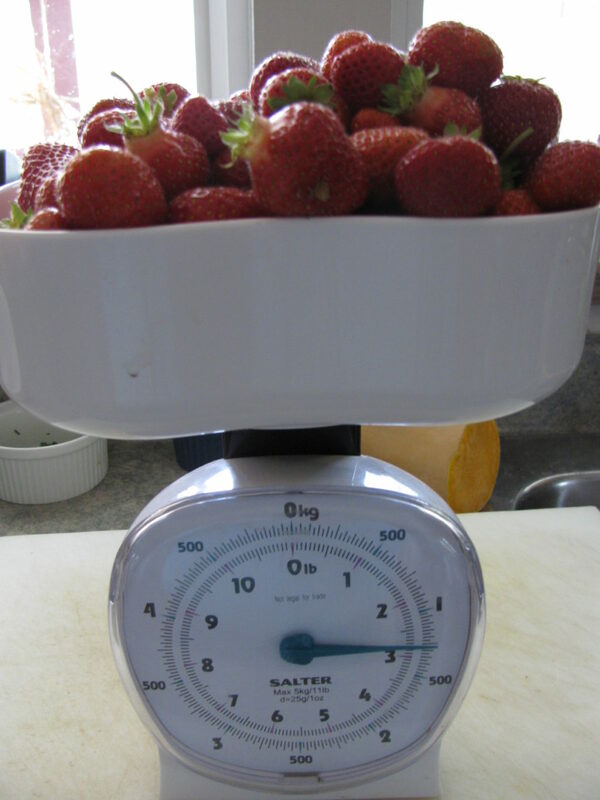 We are so busy here with the gardens and garlic farm, it is hard for us to keep up with the Strawberries. I don’t want you to think there are hours and hours of work in this berry bed. A big bowl full of big berries. And of course, I just had to eat some while I was sitting in the berry patch! Who could resist? Here’s the results – 2 3/4 pounds! I’ll be making Strawberry Freezer Jam with most of these. The rest we will eat fresh. Making freezer jam is super easy and a great way to get started with preserving. No canning involved – as long as you have freezer room to store your jars, you can make enough to last all winter. Many people (most people) here have no problem growing blueberries. I, on the other hand, have had no luck at all, although I have tried several times. The first time, I planted the blueberry bushes in an area that got too much wind. Because we are in a Valley, once the wind starts coming through, it gets pretty breezy (and cool as well). The Blueberries didn’t like it….at all. So I got some more and tried them in the Berry Bed along with the Raspberries. They didn’t like that either, even though they got watered every day with a sprinkler on a timer. Then….I gave up! Whether the Blueberries didn’t like where they were planted or they just didn’t like me, I don’t know. But I never tried again! Just don’t let that stop you, because Blueberries bushes give you a LOT of berries on a small bush. Great for gardening in small spaces or even a raised bed. 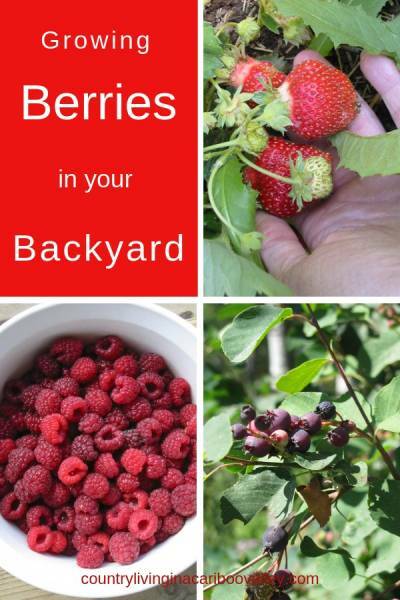 Growing berries is fairly easy, especially if you prepare your beds well. They all like a good helping of well composted manure when being planted. And after that, every year or two, just top dress with more compost. Top dressing is just adding compost (or other amendments) around the base of the bush. Just grab a shovel and add some compost. Watering and rain will bring the goodness of the compost down to the roots. 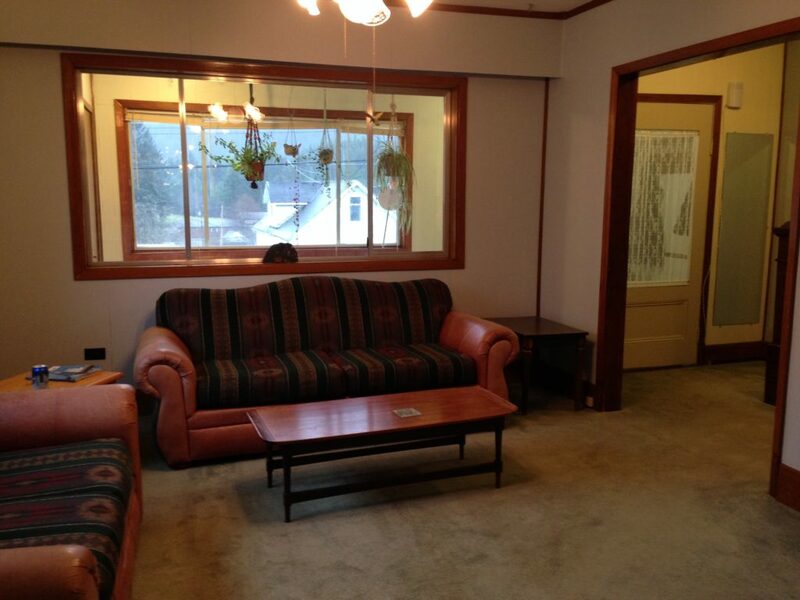 Need to transplant a berry bush? 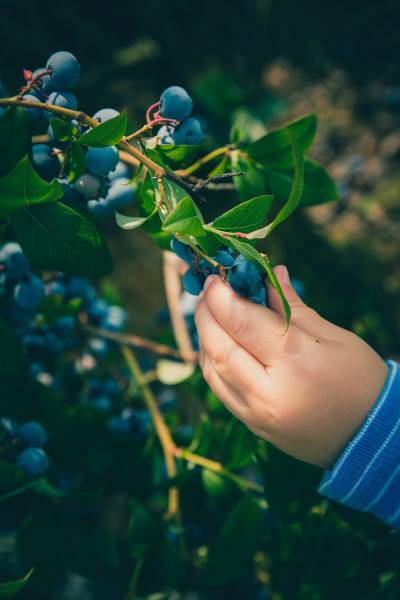 Here’s how we moved a Saskatoon Berry bush – there are things you need to keep in mind, in order for your berry bush to thrive in its’ new home. Raspberry bushes need to be properly maintained so you don’t end up with a berry patch so thick you can’t even get into it to pick fruit. 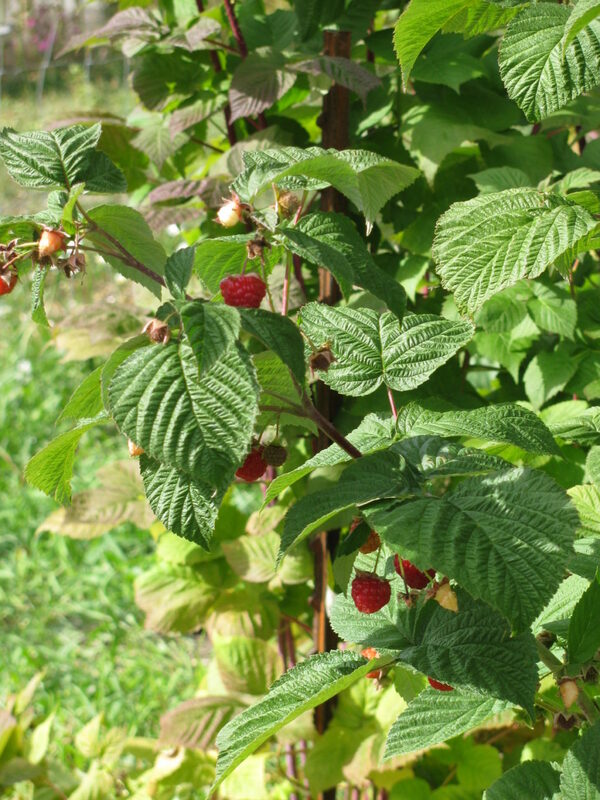 Here’s how we maintain Raspberries – I make sure to do this every Fall! Great information and delicious pictures! 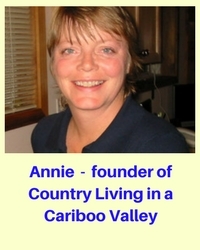 Thank you, Annie! How are things going for you KAri? Starting to wind down now?